How are chromosomes arranged in the cell nucleus? Is it possible that they communicate with one another by "touching" each other? To answer this question and to shed more light on the fundamental properties of the communication between different chromosomes, Philipp Maass from Friedrich Luft's lab at the Max Delbrück Center for Molecular Medicine in the Helmholtz Association (MDC) and Experimental and Clinical Research Center (ECRC), Berlin, and Anja Weise, University of Jena, have explored the interactions between chromosomes 12 and 17 in their latest project, published in the EMBO Journal. Philipp Maass was fascinated by previous findings that genes on different chromosomes interact with one another. Specifically, the long non-coding RNA locus CISTR-ACT on human chromosome 12 "kisses" (contacts) the SOX9 gene on chromosome 17. Therefore, Philipp Maass and Anja Weise explored if these contacts occur frequently in different cells of different individuals and how the interactions of the entire chromosomes 12 and 17 look like. Inter-chromosomal contacts are pivotal for genome organization and gene regulation, but so far, they remain poorly understood. 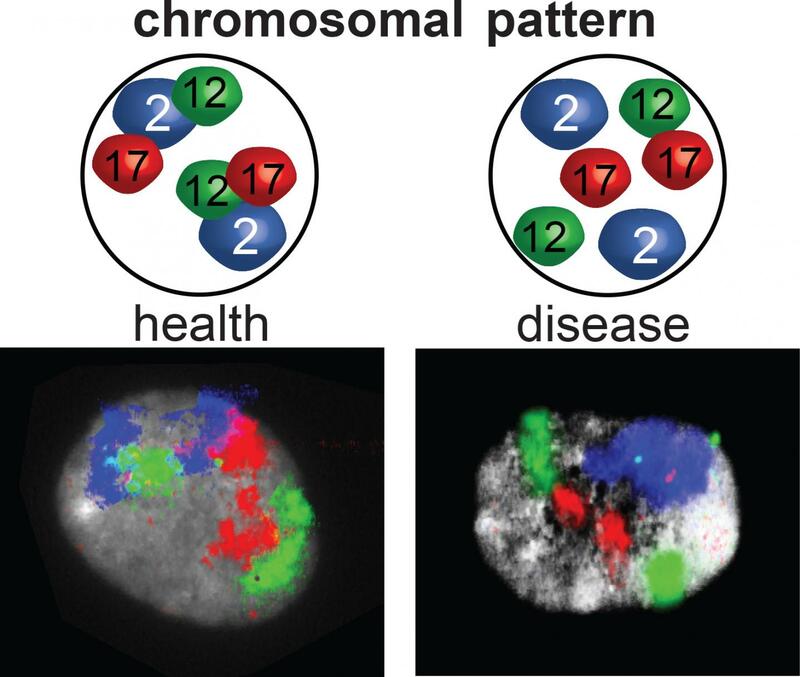 Using human stem cells and derived cells, Friedrich Luft and his team determined that the interactions between chromosomes 12 and 17 occur frequently across different individuals in recurrent patterns. Even in different cells (i.e. fat, bone, cartilage cells, etc.) of the same individual, the two chromosomes communicated to similar extents and with similar shapes. Friedrich Luft and his team have been studying hypertension with brachydactyly (short fingers), but also patients with brachydactyly that did not have hypertension. Now, Philipp Maass and Anja Weise asked if a chromosomal alteration can change these determined inter-chromosomal contacts that they had studied in normal nuclei of healthy individuals. Thus, they recruited a three-generation family with brachydactyly that has a deletion on the long arm of chromosome 2 (2q37-deletion syndrome), which comprises the histone deacetylase 4 (HDAC4) gene. They asked if this HDAC4 deletion can alter the inter-chromosomal communication and supports the shortening of the patients' fingers. Of note, the team detected that chromosomal interactions occurred between three chromosomes: 2, 12 and 17 in normal nuclei and in nuclei of brachydactyly patients with the HDAC4 deletion. But, the HDAC4 deletion resulted in displaced inter-chromosomal arrangements and disturbed interactions between the three chromosomes. Therefore, the investigators propose a direct link between structural chromosomal aberration and altered nuclear architecture that results in a human genetic condition. Friedrich Luft and Philipp Maass suggest that these findings about inter-chromosomal communication driving gene regulation and genome organization are highly important for understanding genome organization and disease progression. Head of research group "Genetics, Nephrology, Hypertension, and Vascular Injury"